Black Rose is a unique and edgy women’s black onyx bracelet that has been lovingly handcrafted in our studio as part of our Boho Luxe jewellery range. It is a stylish casual accessory that you will want to wear time and again. Featuring lovely glossy black onyx beads and a white skull charm, the Black Rose stretch bracelet measures approximately 7″. Black Rose is a unique and edgy women’s black onyx bracelet that has been lovingly handcrafted in our studio as part of our Boho Luxe jewellery range. It is a stylish casual accessory that you will want to wear time and again. 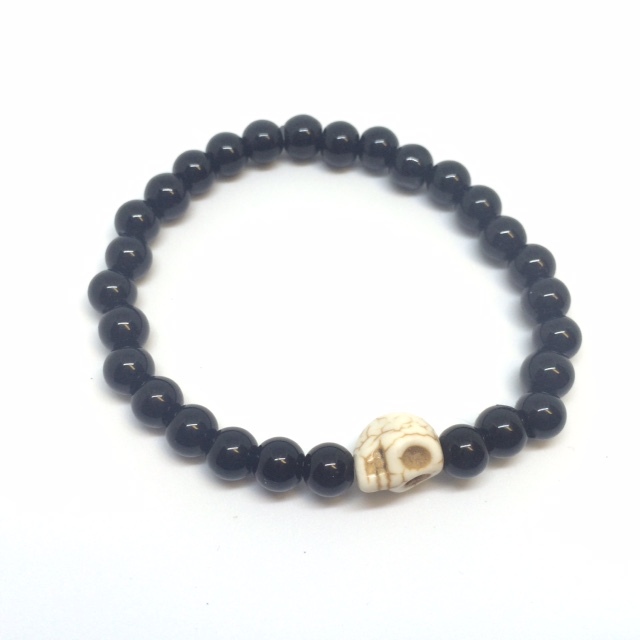 Featuring lovely glossy black onyx beads and a white skull charm, the Black Rose stretch bracelet measures approximately 7″. Customised sizes are available on request – please contact us at info@luxierefashion.co.uk. All of our jewellery is nickel free and hypoallergenic friendly and comes in gift box. Please note that as our products are made from real gemstones, colours can sometimes vary sligtly. Cool and contemporary jewellery for those seeking individuality.